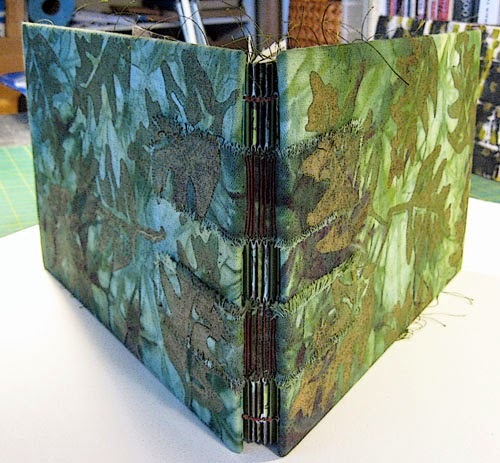 Just finished binding the latest journal this morning. 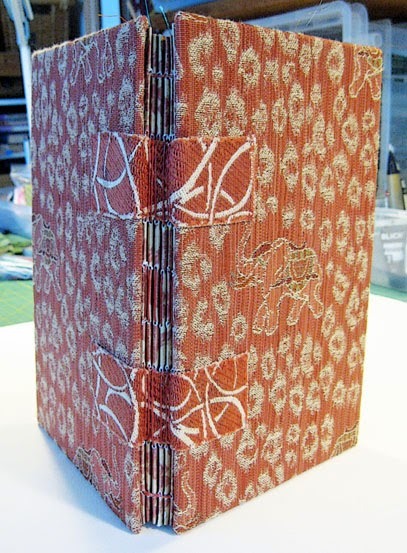 You can see better in the second photo that this is Coptic with French Link binding. 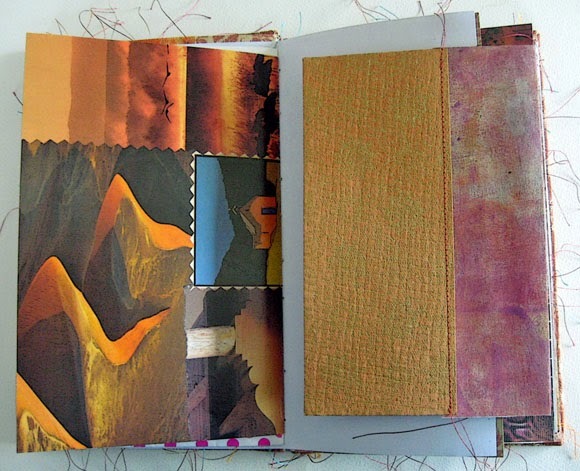 This is my penultimate hand bound book for this book making roll I've been on. Just one more, and then I'll be switching to something else early in 2015. I've already been thinking about the new thing, building the inspiration and desire. I've really liked focusing on one thing for the last few months, and doing a lot of that. It works better for me than constantly changing up what I'm doing, where my focus is, etc. Other than the coming media shift, I have no plans, goals or resolutions for 2015. I don't believe in such things anymore, especially the resolutions part. Come what may, I'll make the best of it. We have no control. anyway, over most of what happens in our lives, and intricate plans usually go awry through no fault of our own. I can say, though, that I aspire to be calmer and more peaceful, to have more compassion, to show more kindness, and to be more heartfelt in all that I do. 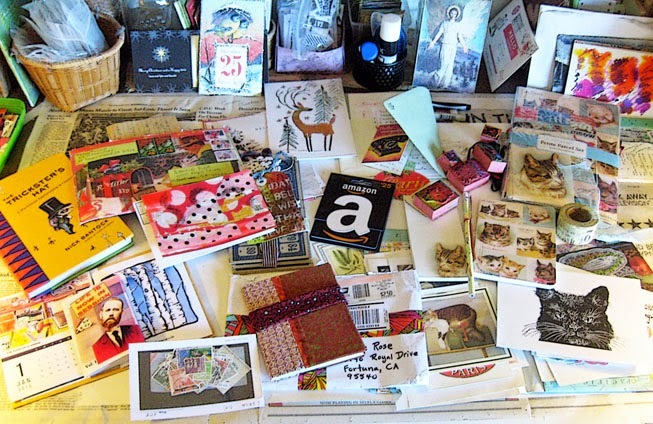 I got a raft of treats for Christmas, nearly all from mail-art and/or blog pals I've never met. Thank you so much to Pamela, Dawn, John, Terry, Ellen, Jen, Donna, Jacki, Kristin, and others who sent cards. For someone who doesn't celebrate Christmas, this was truly lovely. I stopped by Eureka Books when I was in town on Tuesday, and found five great old books in the bargain section. 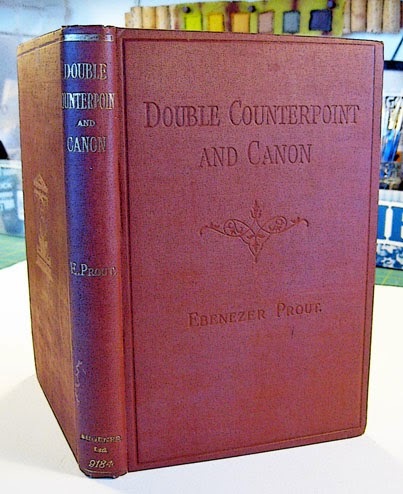 The two Book House volumes are from 1921 and 1925, and I hadn't seen these earlier editions before. 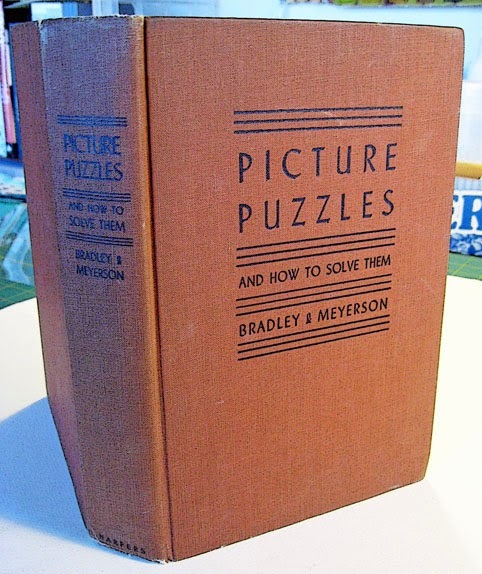 The others I have from that series were published in 1948 and 1953. 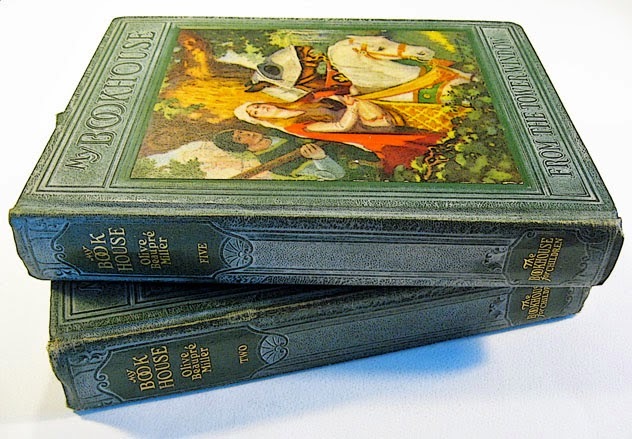 Essentially the books inside are the same, but the covers are way more ornate on the earlier ones. Also, the one on top above is number five in the series, and the title is "From The Tower Window," whereas the number five in the later editions is called "Over The Hills." 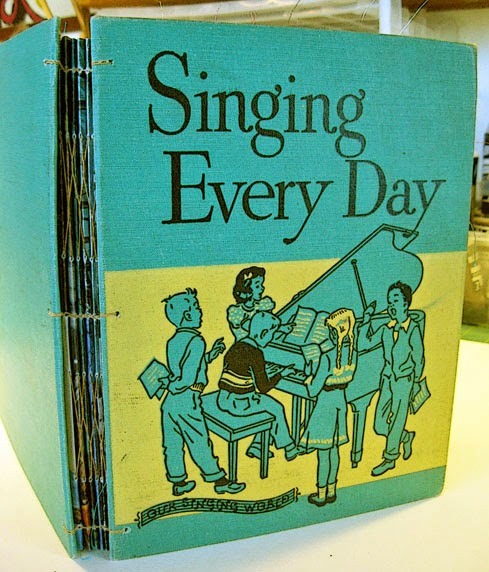 This music theory book is from 1945. 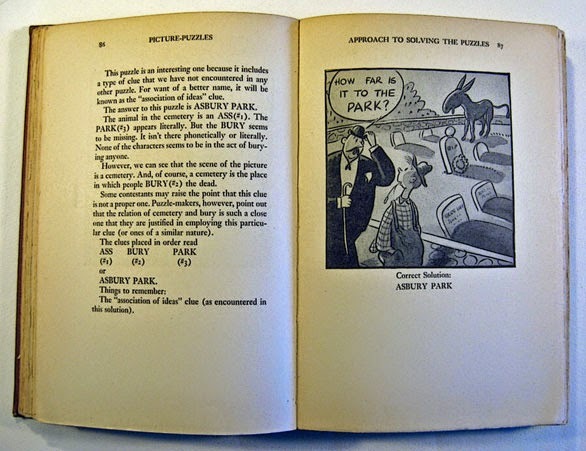 The picture puzzle book is from 1937. Interesting what we used to amuse ourselves with back then. This last beauty is from 1900. Here's my latest book, completed over the weekend. 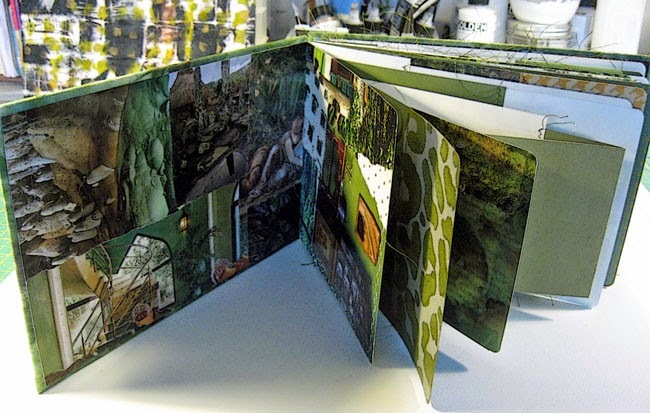 I pretty much used up every last scrap of green paper I had on this one ~ collages, hand painted paper, scrapbook paper, odds and ends. 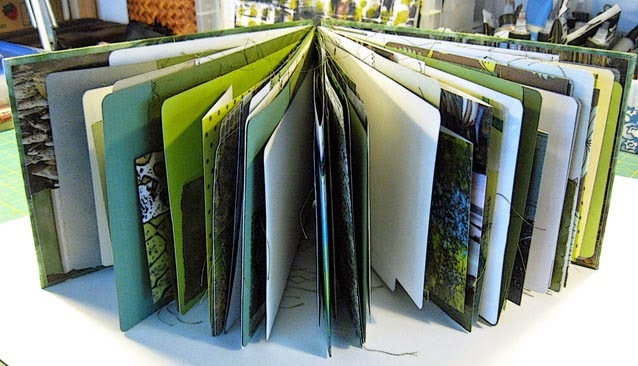 This is another album-style journal, 6-3/4 x 10-1/2 inches, with 7 signatures and 112 pages. I shiboried the vintage cotton fabric a couple years ago, and decided just the other day to add the stamped leaves. I created the self-tapes first, then temporarily positioned them on the covers so that the tapes would get stamped along with the covers. In the last photo, you can hardly see the tapes at all. 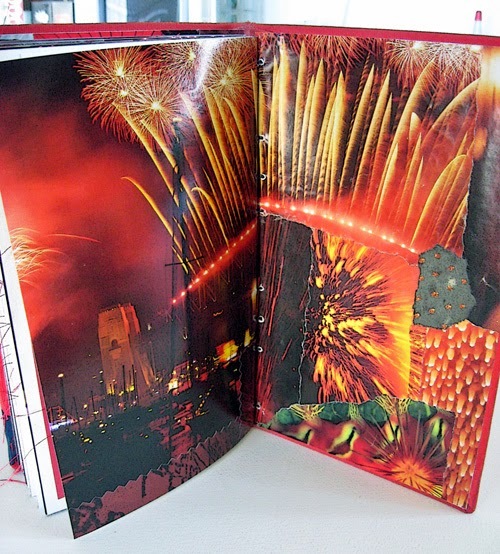 This journal has 10 foldouts and 15 pockets. As I typically do, I made too many folios, so now I have two signatures left to bind separately. 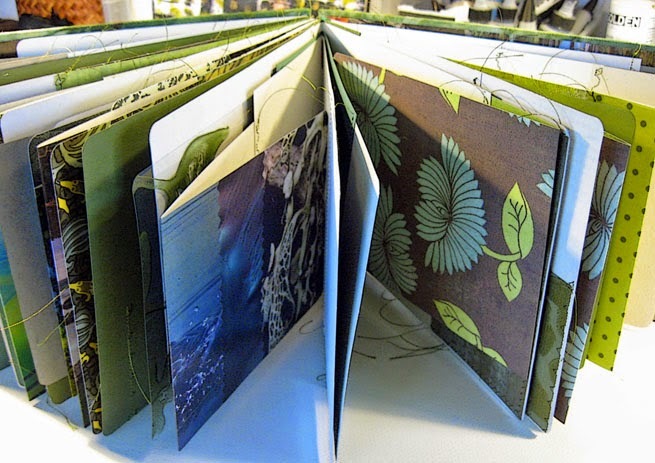 I love this binding technique, as I've said before ~ sewn on tapes. And I prefer making my own tapes than using ribbon or anything else ready-made. That lovely sewing frame I built back in September, that I was inspired to make after using one in a bookmaking workshop I took, is sitting idle. 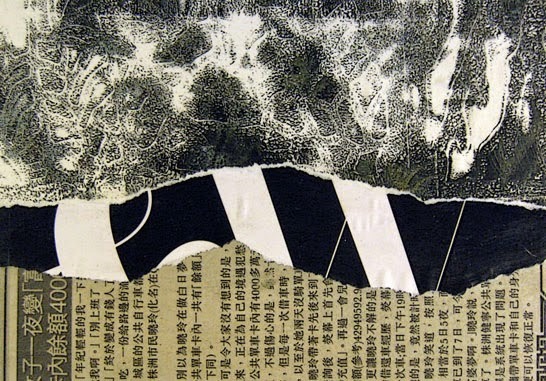 Besides being cumbersome to use, it's actually totally unnecessary, especially with cut-to-size handmade tapes. It's a lot easier to work on the edge of my worktable instead of having another gizmo to manage while binding. One of you may have received this in the mail, for all I can remember. Just checking in here, not much going on. 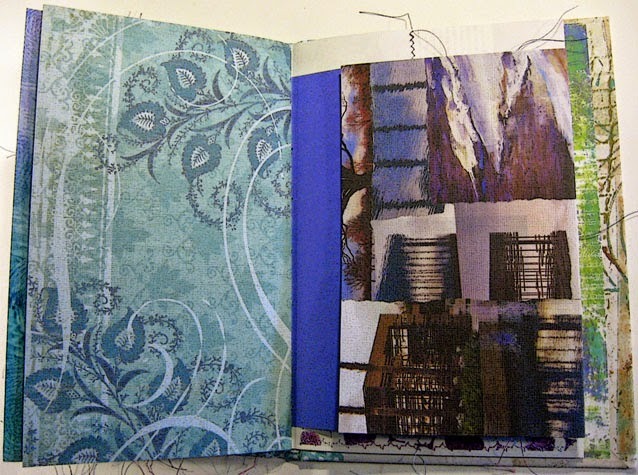 I have a bunch of papers and collages on my worktable ready to become a journal, and the book boards already covered with fabric for same. I just haven't felt motivated in the last few days. I've been reading an awful lot, though...but that's nothing new. I might just read myself out of this year and into the next. Just finished a book I enjoyed a lot, called The Good Father, by Noah Hawley. Also recently finished In the Presence of the Enemy, another Inspector Lynley novel. The last two in this series (including Playing For the Ashes) have been particularly good; I think the series is getting better overall. Thanks to those of you who recommended I read it all. Not long ago I watched the first BBC Inspector Lynley episode, and got bored with it. I've seen them already, several years ago, but after reading the books, the TV episodes can't hold a candle to them. Seeing actor Sharon Small as Sgt. Havers in my mind as I'm reading, though, is a good thing. We're having rain on and off, and it's lovely. 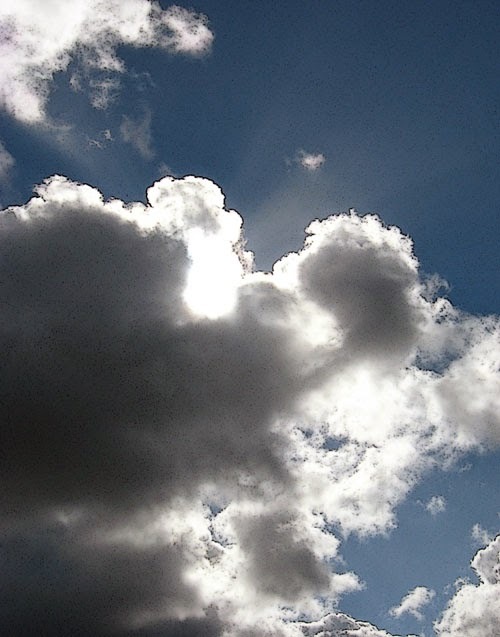 So far this is shaping up to be a wet rainy season ~ sounds like a no-brainer, I know, but for the last several years we've had dry rainy seasons...i.e., no rain when we should have been having it. So let's all keep our fingers crossed. 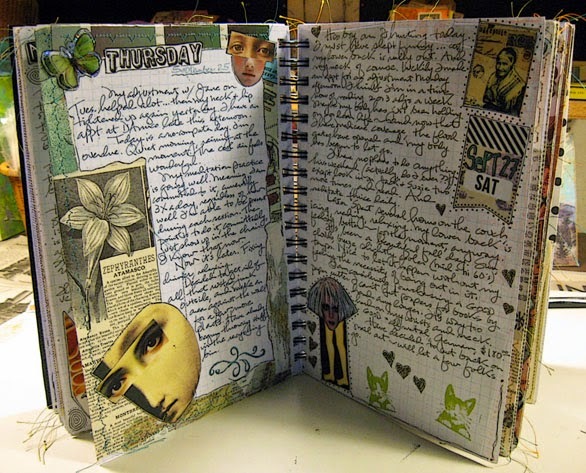 This is the journal I tore apart and rebuilt. 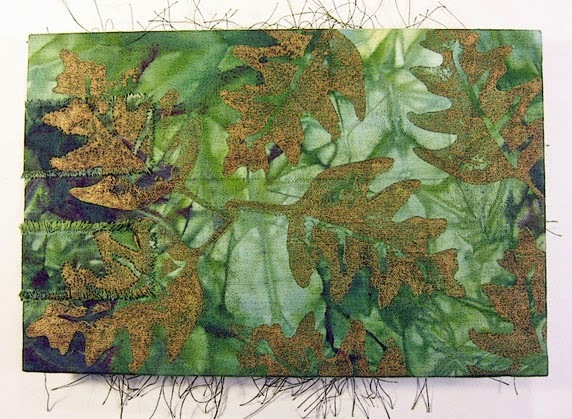 It's the same structure as it was ~ long stitch with sewn on tapes ~ and I used the same handmade fabric tapes. 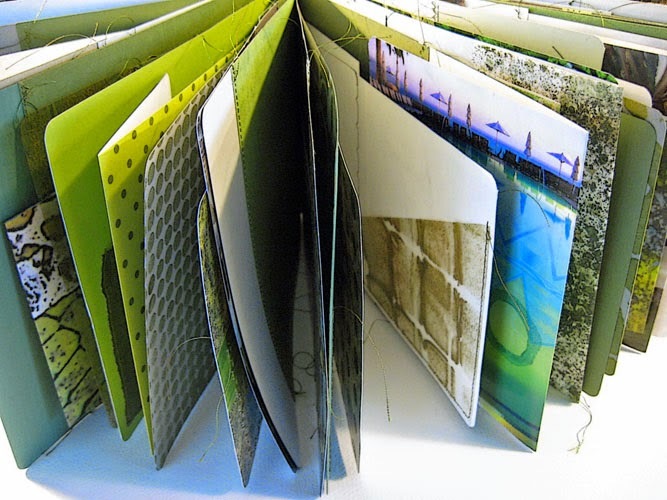 Previously the book had signatures that had been glued together as well as a number of recycled magazine pages that weren't as hefty as I now prefer (I'm no longer using recycled paper for my handmade books, unless it's non-glossy and heavy enough to write on). I kept a couple of folios from each of the original six signatures, added folios to each, and then repunched the original holes in all. 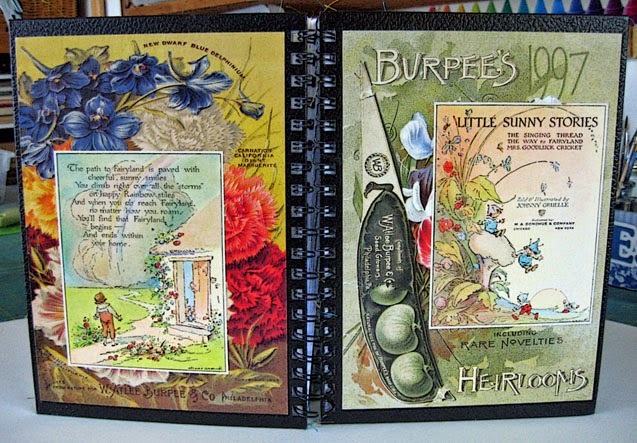 The journal is 9 x 5-3/4 inches, has 96 pages, 11 foldouts and 13 pockets. 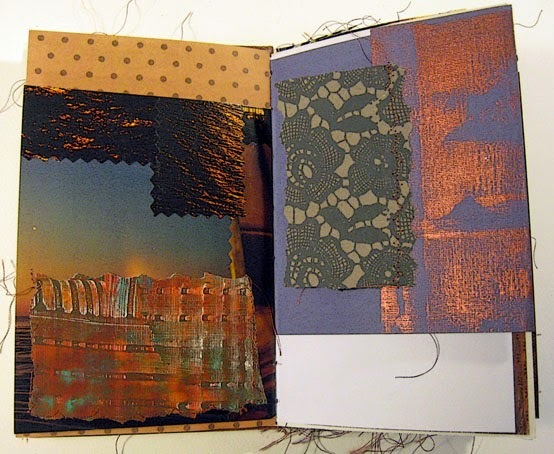 This last folio is one of two left over from the original shabby journal I made in Mary Ann Moss's Remains of the Day class, two plus years ago. 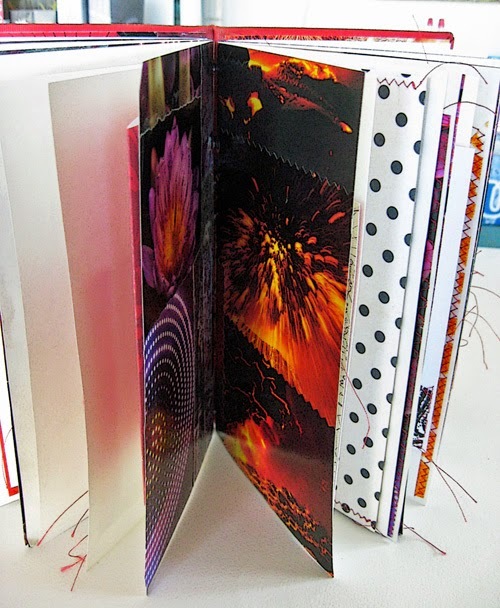 I had too many folios to bind in back then, and have been saving the leftovers to use when I could, elsewhere. I finished this journal today. This the second one with a cover that I'd remodeled a couple years ago. 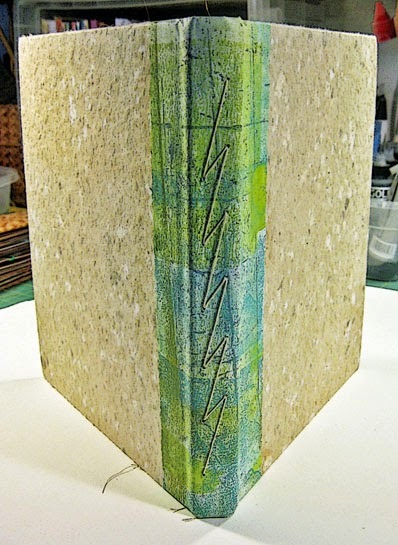 The book is 10 inches high by about 9 inches wide. 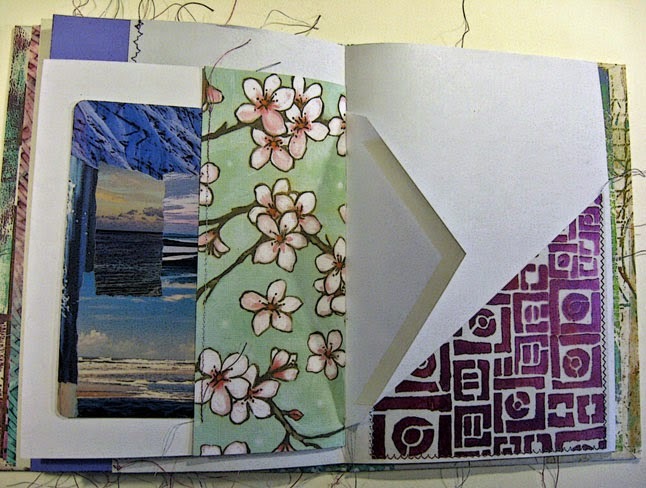 I decided to make it a plain journal, with all white pages except for the collages that form the outer folio of each of the two signatures. There are 80 pages and four pockets. 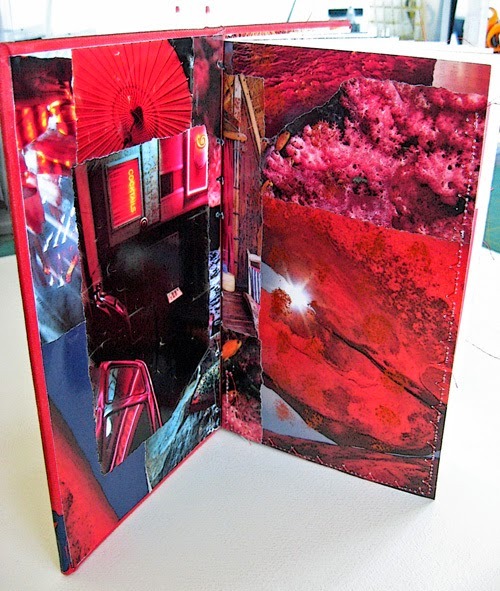 I didn't want to add foldout extensions and a lot of other embellishments since the pages are so big to begin with and the book is so thin. So this journal is plain and simple. Last night I ripped apart a book I made a couple years ago...one of those I mentioned where I'd glued the signatures together. 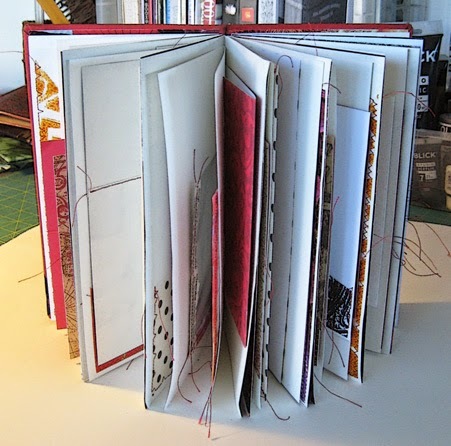 Today I added folios to what was left of the original signatures, and stitched on pockets and page extensions. Will bind it tomorrow. I showed you this journal sometime earlier in the year. 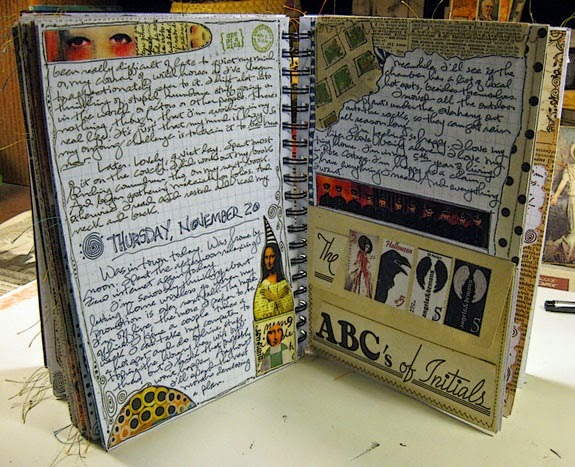 It was to be my hybrid writing journal/daily-ish art journal. I've been working in it since August. Here are a few page images. 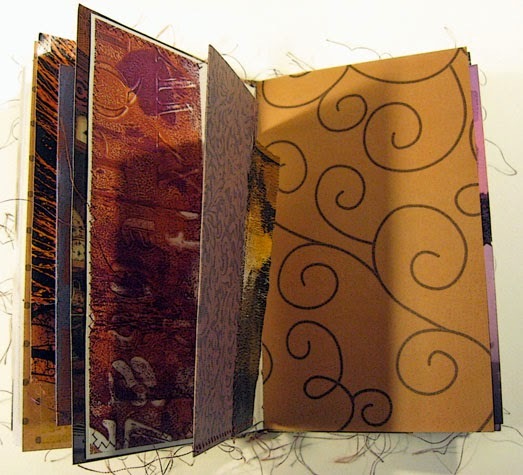 I'd taken the removable spiral binding out of the Cachet grid journal, stitched stuff on a number of pages, stacked the stitched pages alternately with non-stitched ones, and put the spiral binding back in. 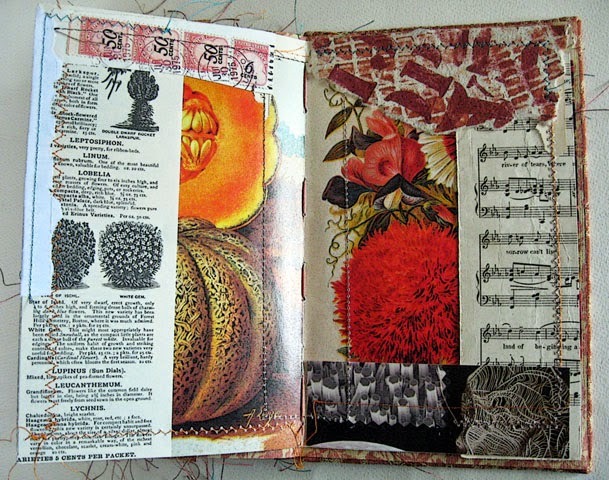 I've been using bits and pieces of Teesha Moore's collage sheets to further embellish the non-stitched as well as the stitched pages. She graciously made available for download a ton of her fab collage imagery to members of the Artstronaut's Club this year. The collage sheets were really the only things I took away from a year in the club. It was just way too overwhelming, all the inspiration and ideas that were posted nearly every day. There was no way I could have kept up even if I'd wanted to. After all, this was the year I let go of so much DO. Needless to say, I will not be renewing my membership for 2015. More is never better in my book ~ it just engenders insanity. I'm reading an incredible first novel by Smith Henderson, called Fourth of July Creek. It's amazingly good. By and large, I prefer obscure films, many of them British or otherwise foreign. How do I find them? I peruse Netflix's offerings regularly and check the ratings. I stay away from mass-marketed movies unless the film has had really good reviews and/or I want to see the particular actors' work. The coming-soon trailers on the films I do watch nearly always have a couple of movies I want to see and I add those to my queue at Netflix. I've got over 100 films in my queue at the moment. 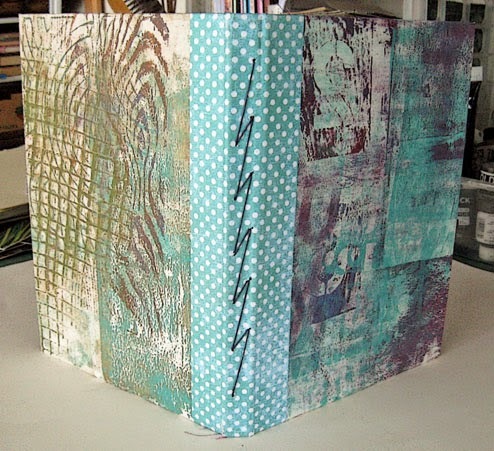 I covered this thin book with Gelli printed papers probably a couple years ago now. 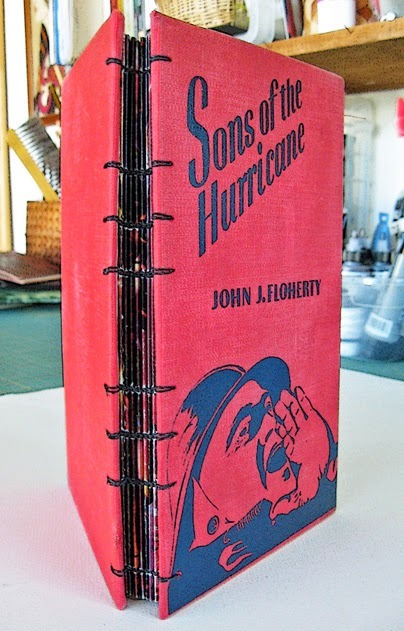 Yesterday I made signatures and bound it, with my favorite two-section binding, the Lightning Bolt (see Keith Smith vol. 2). 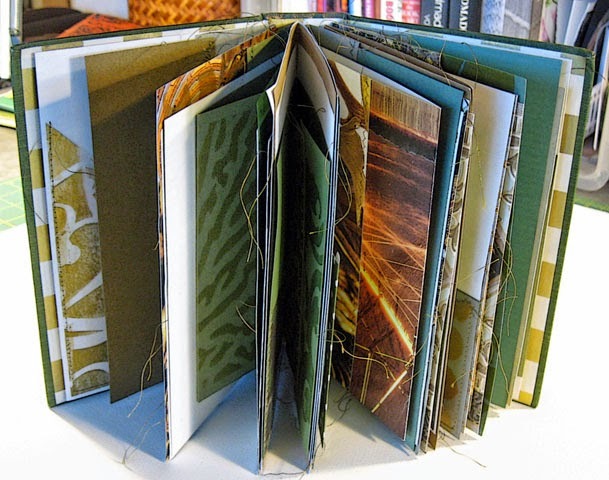 Two-section binding means both signatures were sewn at the same time; the thread moves from one signature to the other on the outside of the cover, while moving vertically within each signature on the inside of the book. 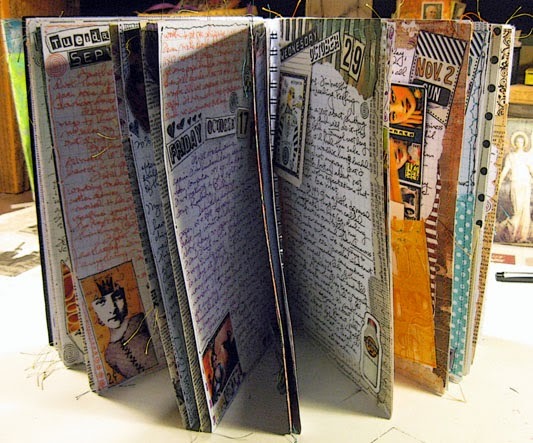 This journal's stats ~ 10-1/2 x 7-1/2 inches, 9 pockets, two foldouts, 56 pages (2 signatures of 7 folios each). I have another already-prepped cover, same size, that I'll be finishing off later this week, also with the Lightning Bolt stitch. ...to respond to several of your comments. 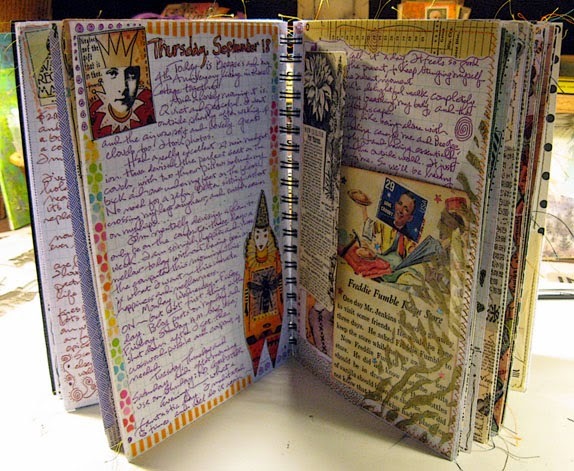 The journals I've been making recently are just for myself, basically. I don't want to part with any of them at the moment. If this changes in the future, i.e. if I post them for sale somewhere, I'll let you know. Also, I appreciate your comments about my giving an online class or classes. Unfortunately I am not set up to produce videos of my work and/or me working, so I have no plans to create and market online classes. Sorry. But thanks for asking. I just finished this book...for the second time. 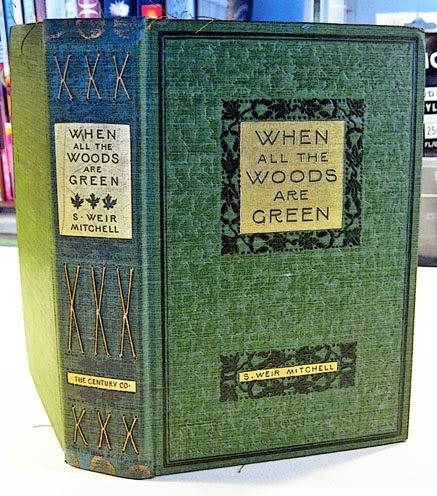 I bought it early this year for the cover, plus it had a cool spine. My first attempt at making it into a journal was completed yesterday. 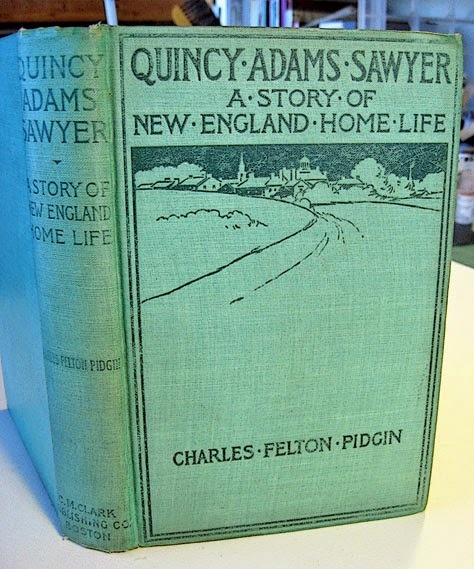 It was originally sewn on ribbon tapes which weren't visible because of the spine. But I kept looking at it last night...I didn't like the way it went together inside. So after a couple hours, I just ripped it apart. 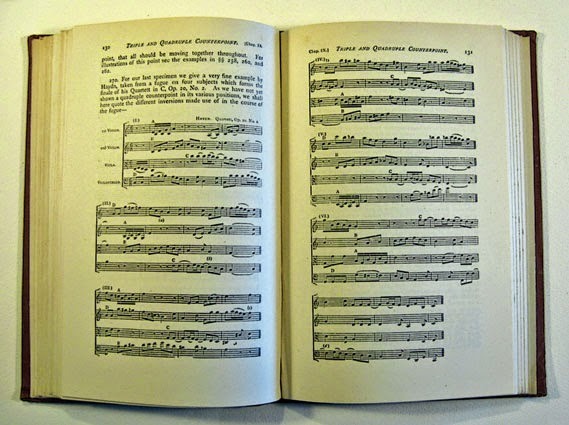 Originally there were four signatures of six folios. 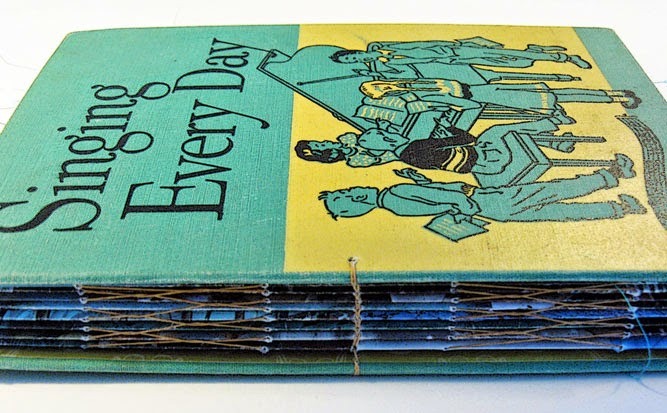 The book wasn't in the greatest shape to begin with ~ I think was from the very early 1900s ~ and I subsequently couldn't save the spine. 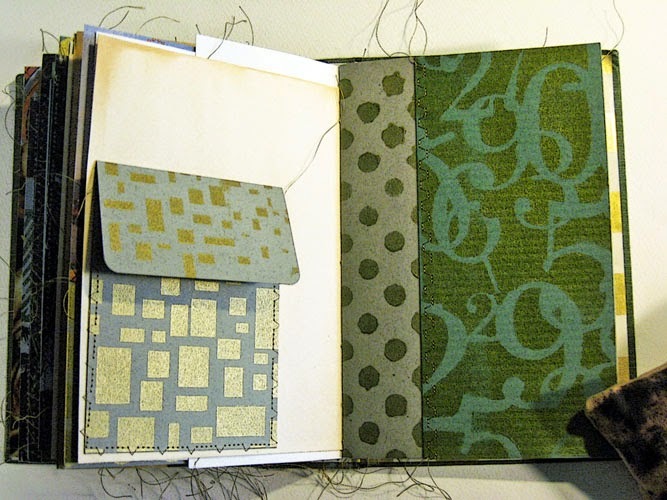 Once I'd decided to rebuild it with Coptic stitch binding, I decided to add two signatures, which proved unnecessary. 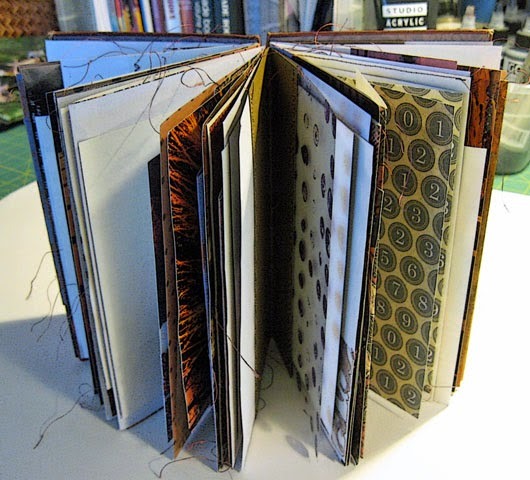 Consequently the finished book is really fat and doesn't stay closed without a black velvet ribbon. Which is just fine. Plus, the pages are slightly wider than the covers...oh well. 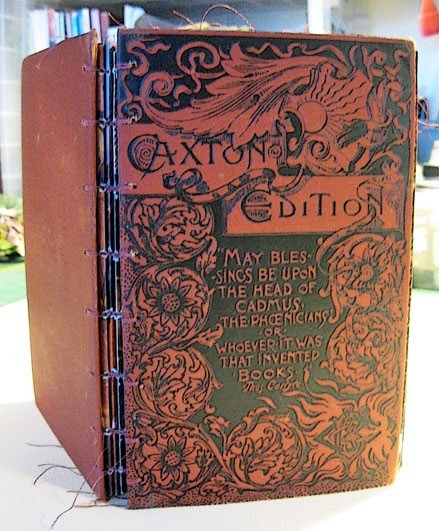 Anyway, the finished specs are these ~ 144 pages (6 signatures of 6 folios each), 11 foldouts and 23 pockets. I definitely got carried away on this one. I finished this guy yesterday. I just love the original cover. 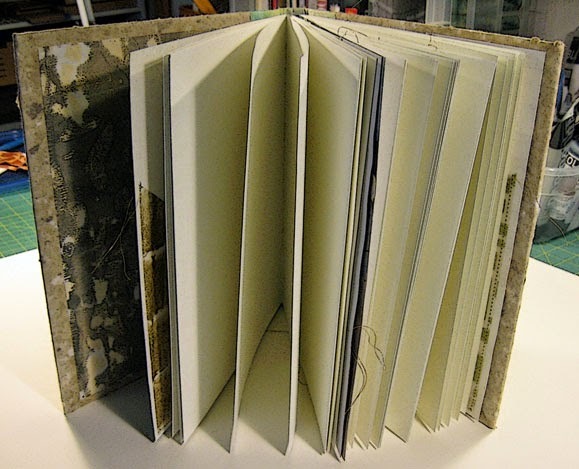 The journal is 5-1/4 x 7-3/4 inches, has 96 pages (6 signatures, 4 folios each), 18 pockets and 7 foldouts. The binding is a modified long stitch. Although it appears to be a version of a 2-section X stitch (two sections, or signatures, stitched in at the same time), in reality each section was sewn in individually, with knots made on every second section. I.E., the thread on the 2nd, 4th and 6th sections was wrapped around the thread on the 1st, 3rd and 5th sections. 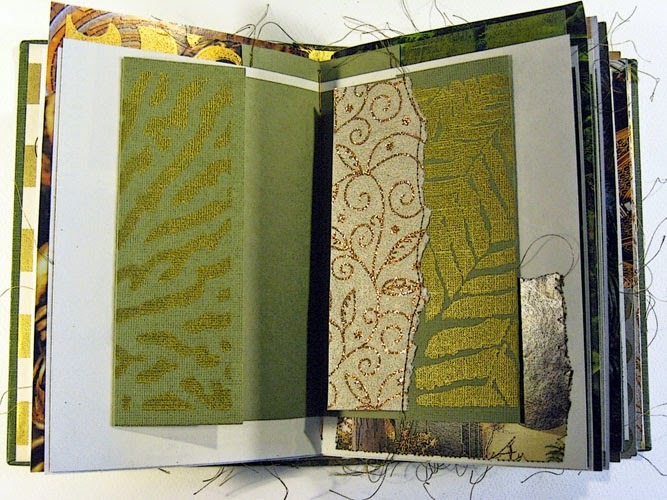 I'm working on a green and gold book, an old one I'm making into a journal. 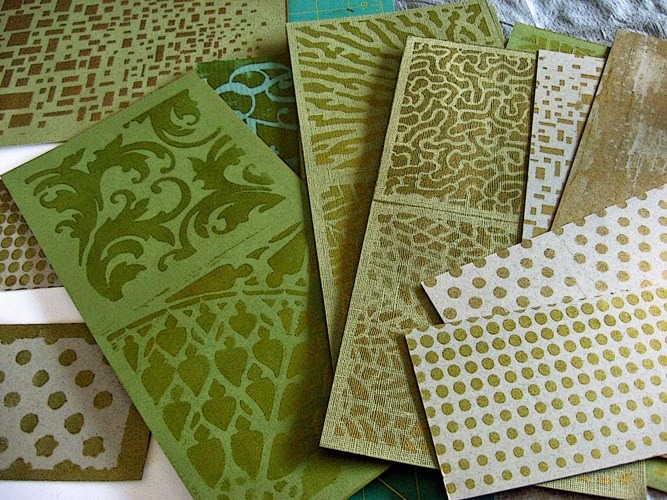 This morning I printed a variety of green cardstock papers with metallic green-gold paints. Today BeeGee and I are celebrating our 10-year anniversary together. He's been my partner, my soulmate, the love of my life since 2004. 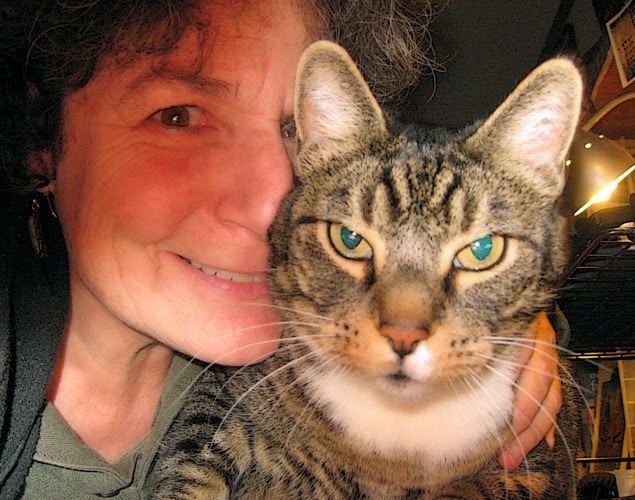 Actually, I had two other kitties when BeeGee joined the family, but as of late 2006 he's been my one and only. We're happy as clams together. BeeGee's irises aren't really turquoise ~ it just looks that way in the photo. More great recent reads: Faithful Place, the third in Tana French's Dublin Murder Squad series ~ fantastic book. Fault Lines by Nancy Huston. I'm currently reading Special Topics in Calamity Physics by Marisha Pessl ~ this was her debut novel, and it's terrific. I'm two books further on in the Inspector Lynley series; will begin Playing for the Ashes soon. I read May We Be Forgiven by A.M. Homes recently and have another one of hers on my stack from the library. 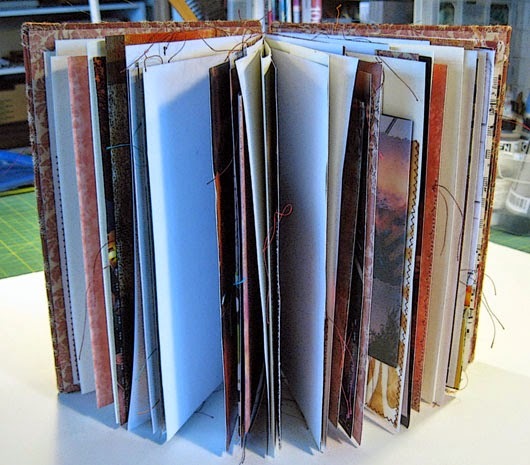 Hot off the press...another Coptic stitch book just finished. This was one of the few books I got at the Eureka Library sale late last month. 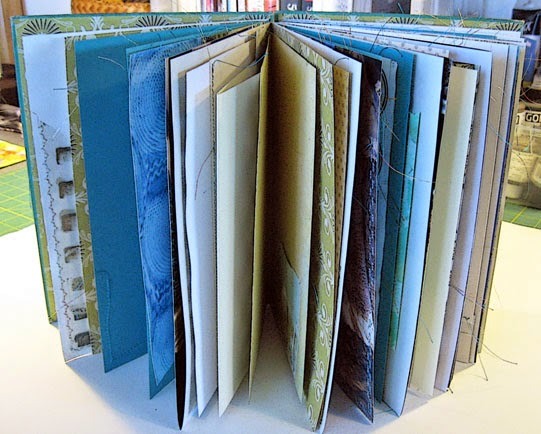 This journal is 9-1/8 x 5-5/8 inches, has 128 pages (8 signatures with 4 folios each), 19 pockets and 3 foldouts. Red is not a color I usually gravitate toward but I really liked the cover art. I used up all my red collages on this one. Fourth image down is the inside back cover and back page of the last signature. I didn't realize until I took the photos just now that both of the collages I'd done used pieces of the same original NatGeo photo. And here I lined them up without even thinking about it. Pretty interesting. 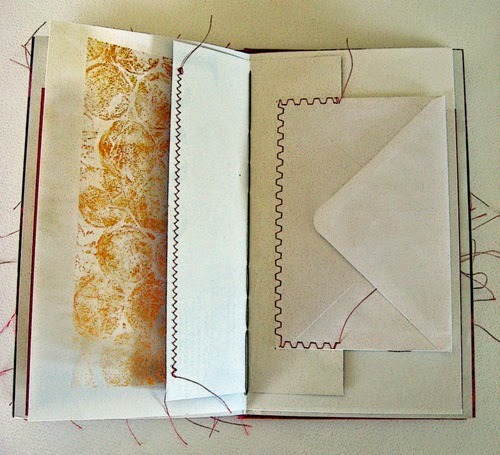 The 19 pockets in this journal include two like this ~ small envelopes stitched on as page extensions. 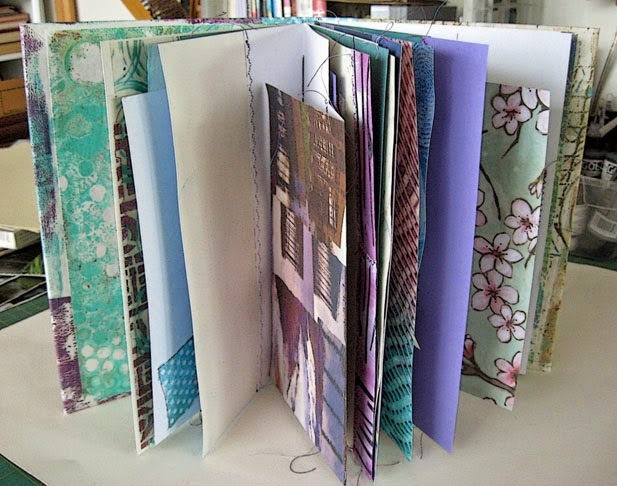 This is something else you can do to create hidden places in books, as well as just using envelopes as folios by themselves. 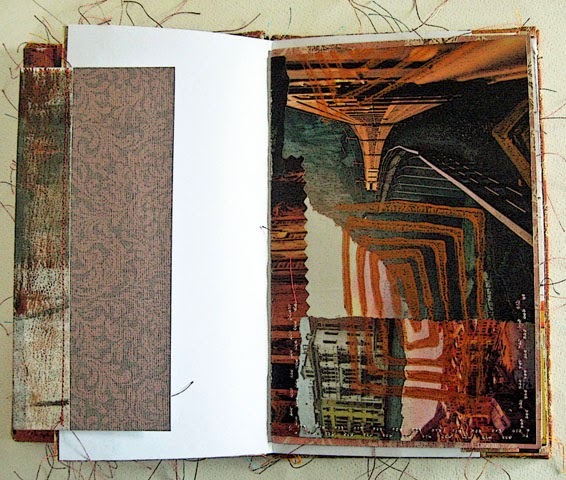 I'm really enjoying this bookmaking roll that I'm on. There's something so satisfying about making a journal, about turning something old and useless into something with a purpose.